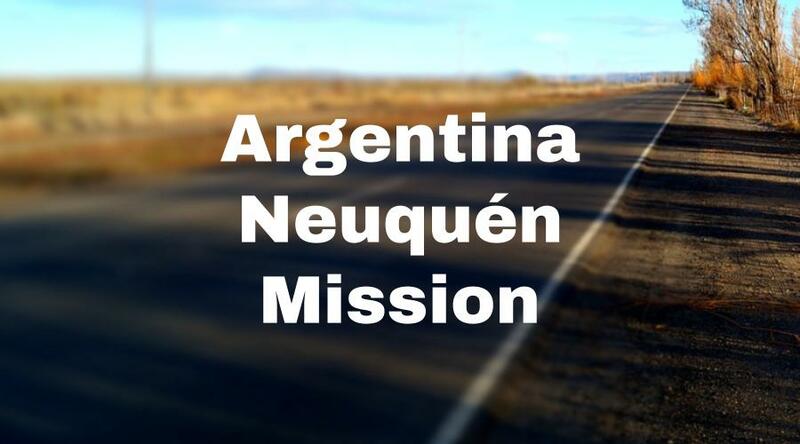 Here’s a recent address for the Argentina Neuquén Mission. We try to keep this info up to date, but it’s a good idea to check the mission address with several sources, including your mission packet or the mission office. Here’s a list of LDS missionary blogs for the Neuquén Mission. This blog list includes the missionary’s name, URL and when their mission blog was updated. Here are Neuquén Mission Groups- for LDS missionary moms, returned missionaries, mission presidents and other alumni of the Neuquén Mission. Here are T-shirts for the Argentina Neuquén Mission! 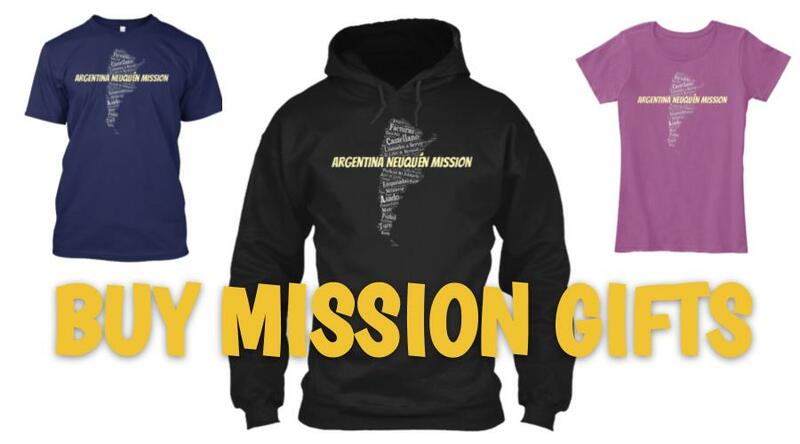 Shirt designs include Argentina Neuquén Mission logo/emblem shirts and Called to Serve shirts. The shirts make great gifts for pre-missionaries, returned missionaries and missionaries currently serving. LDS Mission shirts come in all sizes: Small, Medium, Large, Extra Large, up to 4XL. The mission designs are printed on white shirts and are shipped to you. *Simply click on a shirt design to view the details and submit an order. 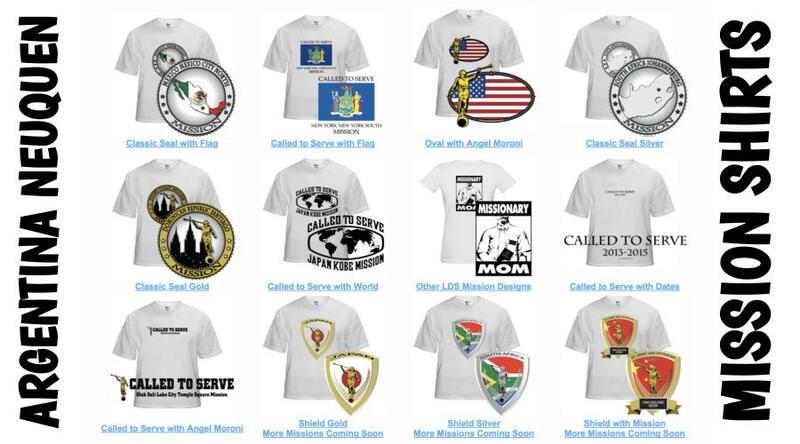 The designs on mission t-shirts may also be printed on other LDS mission gifts, including: Neuquén missionary aprons, Christmas stockings, ties, pillow cases, teddy bears and Christmas ornaments. Here’s a list of current and past Mission Presidents of the Neuquén LDS Mission. Here are some helpful blog posts about Argentina, written by returned missionaries. Here are survey responses from Argentina Neuquén RMs, to give you a snapshot into what it’s like to live in Argentina. What’s a favorite food you ate in Argentina? What’s the craziest food you ate in Argentina? What crazy/dangerous experience(s) did you have in Argentina? What spiritual experience(s) did you have on your mission? Any cool facts about the Argentina Neuquen Mission? What was the weather like in the Neuquen Mission? What’s something you wish you did to prepare for your mission? What advice for pre-missionaries going to the Argentina Neuquen Mission? Any things you really like about Argentina/Argentinians? What things can you not buy in Argentina? Is there anything you wish you knew/did at the beginning of your LDS mission? What was a funny language mistake on your mission? Is there a principle from the scriptures that you think is helpful to missionaries? Any advice/testimony for pre-missionaries going to Neuquen? Danielle’s mission interview includes (2011-2013): Danielle’s choice to serve a mission, being temporarily reassigned to the Texas McAllen Mission, interesting facts about the Neuquen Mission, Argentinian Spanish, travel tips, a funny story about cats, what it’s like to live in Bariloche, helpful advice for sister missionaries, the blessing of mission presidents, a memory of meeting her Mom’s trainer, uplifting Gospel messages in Spanish and much more. Tawnette’s mission interview includes (2011-2012): Tawnette’s decision to serve a mission, experience at the MTC, arriving to the mission field and interesting facts about the Neuquen Mission. She also talks about the food, crime, transportation, weather, sister missionary clothing tips, missionary companions, helping less actives and the importance of keeping a mission journal. Bradley’s mission interview includes (2008-2010): Bradley’s advice for pre-missionaries, interesting facts about the food, climate, places to see, traditions, history, lifestyle and crime in Argentina. Bradley also shares some impactful life lessons on patience, and companionship unity. He finishes his interview with a couple inspirational messages in Spanish. Alex’s mission interview includes (2008-2010): Alex’s memories from the MTC including: avoiding his girlfriend, serving other missionaries and eating in the cafeteria. Alex shares some spiritual and crazy mission stories, involving: dogs, drug lords, getting robbed, being spiritually strengthened, finding 100 new investigators in one week, trying new contacting techniques, preaching boldly on buses and meeting someone prepared by an inspired dream. He also talks about Argentine culture, Patagonian winds, misconceptions about the Church in Argentina and fun service projects. Melanie’s mission interview includes (2008-2010): Melanie’s decision to serve a mission, revelation regarding the inspiration of her mission call, advice for future missionaries called to the Neuquen Mission, the importance of promising blessings to investigators and advice for sister missionaries on dealing with discouragement. Melanie also shares some culture tips about Argentina, interesting facts about some areas she served in and an amazing story about how she prepared five converts in one transfer. Kempton’s mission interview includes (2006-2008): Kempton’s testimony and advice for future missionaries and mission stories about being punched, finding a golden investigator, visiting a bark-less tree forrest, observing political manifestations and celebrating Argentina holidays. Kempton also talks about the windy weather of the Patagonia, water sanitation, volcanoes, soccer, food, crime, politics, city layouts and holidays. He also shares some interesting history behind Argentina’s Open Door Policy, the Dirty War and Argentine cowboys (“Gauchos”). He finishes his interview with several clips in Spanish for non-members searching about the Gospel on YouTube.